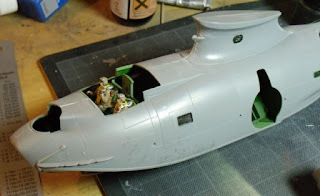 Gentle Scale Modelling: My, is this catalina big! My, is this catalina big! I am working away on this thing but I have no idea where I am going to put it. 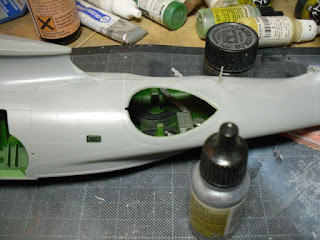 As you can see, I have got as far as the fuselage plus the wings. Fortunately, the wings can be painted before fitting, as can the floats so it won't be hard to get the paint job done. If you remember your 'South Pacific', whenLieutenant Cable flies in to the island in a Catalina, the pilot is using the overhead throttle and pitch controls. If you look carefully, the right hand co-pilot, is in that pose! The canopies are quite complex in their framing so I have an Eduard mask set coming on Friday. Here are pictures of the current state of play. It is big and its coming along very nicely but don't let your guard down as yet. Interior seems excellent! Finally - the secret model exposed!